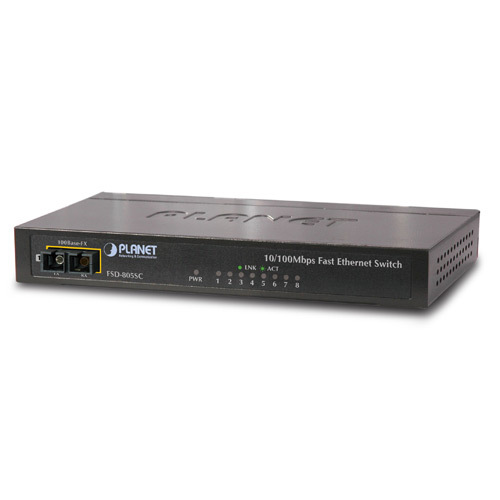 PLANET FSD-805 series –FSD-805SC,FSD-805ST and FSD-805S15–is a 10/100Mbps Fast Ethernet Switch in a compact housing for easy placement on desktop. With 8 ports and auto-negotiation capability, all the RJ-45 ports in the FSD-805 series can be configured to data rate of 10/20Mbps or 100/200Mbps automatically. To meet the increasing bandwidth requirements for local area networks, the FSD-805 series provides non-blocking wire-speed performance and 1.6Gbps internal switching fabric. It is the ideal option to alleviate bottlenecks in client / server and peer-to-peer environments in a cost-effective way. The FSD-805 series also supports Store-and-Forward forwarding scheme to ensure low latency and high data integrity, which eliminates unnecessary traffic and relieves congestion on critical network paths. With an intelligent address recognition algorithm, the FSD-805 series could recognize up to 2K different MAC addresses and enables filtering and forwarding at full wire speed. All RJ-45 copper interfaces built in the FSD-805 series support 10/100Mbps auto-negotiation for optimal speed detection through RJ-45 Category 6, 5 or 5e cables. With auto-MDI/MDI-X feature support, the FSD-805 series Switch can detect the type of connection to any Ethernet device without requiring special straight or crossover cables. The FSD-805 series has one 100Base-FX optic-fiber SC / ST interface port which can be chosen via the DIP switch. The FSD-805SC,FSD-805ST and FDS-805S15 are also ideal to extend the network distance up to 2 km or 15 km away as a link to your remote backbone. Moreover, the Flow Control function allows the FSD-805 series to support routers and servers directly connect to it for fast, reliable data transfer. With 8 10/100Mbps Fast Ethernet ports, the FSD-805 series provides a cost-effective and high-performance solution for Home / SOHO applications. In multiple applications, the advanced functionality of the FSD-805 series eliminates traditional issues associated with the current Ethernet environment. With options of multi-mode / single mode 100Base-FX SC / ST interface, the FSD-805 series fiber transmits distance up to 2km or up to 15km away for uplink to core Switch or backbone in a small office, factory or warehouse Ethernet connection. Multi-mode optic fiber 62.5/125μm, 50/125μm (FSD-805SC / FSD-805ST. 2km, max. ).